2 days ago, last Tuesday, I have attended the Austrian Wine Tasting organized by the Austrian Wine Marketing Board in Restaurant Sipuli (Ravintola Sipuli) and I am totally impressed by the elegant, chic, characteristic, charismatic Austrian wine. 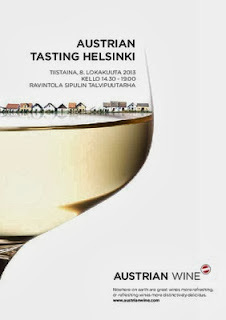 Soon I will write about the tasting event and the wines I tried. May your glass be filled with Austrian wine. Greetings.